Our center is always looking for new volunteers to help us with everything from day-to-day operations, to special events. Whether you want to help out just once, or on a recurring basis, we’re happy to accommodate! Help with our day-to-day operations by greeting visitors, assisting in our gift shop with stocking and sales, putting on costumes and taking photos for visitors, and even guiding group tours. We are happy to adjust your duties to your comfort level, and all training is provided. Our free events are often a blast for the whole family, but we couldn’t make them happen without all the volunteers who help us. Volunteering at events often entails assisting kids with crafts or activities, but can also include things like serving pie, attending to mobile or temporary exhibits, or guiding a 5K through the streets of Eldon. One of the lesser-known features of our center are the prairie-flower gardens that adorn our center and lead up to the Gothic House. 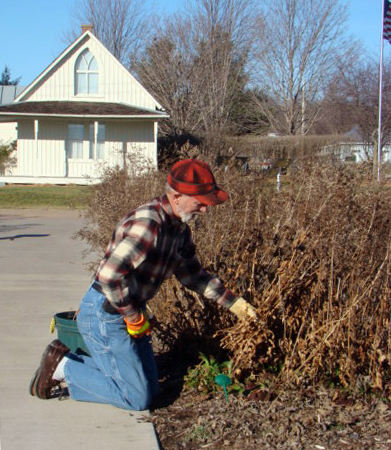 Whether you’re a beginner or have a green-thumb, our gardens need a lot of love throughout the spring and summer, and our volunteers are essential for keeping our gardens beautiful. To get started volunteering with us, you can reach out to our administrator, Kelsy, at theamericangothichouse@gmail.com or by calling 641-652-3352. Whether you are an individual or a group, we can find an opportunity that works for you. If you’re not looking to immediately volunteer, but would like to know about opportunities as they arise, you can also let us know by sending us your contact information, and we can put you on our volunteer emailing list. We’re also happy to answer any questions you might have, so please don’t hesitate to email or call! If you have any internship projects in mind, or want to see what we could offer you, let our administrator know! Contact Kelsy at theamericangothichouse@gmail.com or 641-652-3352.